January 27, 2017 is the start of the Chinese Lunar New Year, the Year of the Rooster. 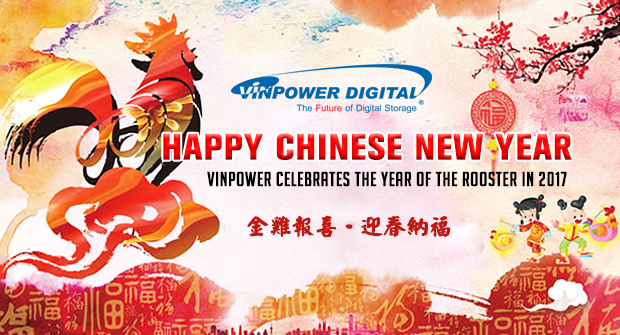 Whether or not you celebrate the Chinese New Year, everyone at Vinpower wishes you much prosperity and good health throughout the New Year. Please be aware that the Taiwan and China offices will be closed Friday, January 27, through Wednesday, February 1, in observance of the Chinese New Year. If you have any requirements that require attention from one of these offices, please contact us prior to the offices shutting down for the holiday. Otherwise, any issues or if you need to reach a representative during the time the offices are closed, please contact a member of the US Vinpower office or EU sales office and we will be happy to assist you. For more details on any of the products that Vinpower carries, please visit our website at www.vinpowerdigital.com, or speak with an official Vinpower representative near you.